For many years, OCHU/CUPE has been concerned the Ontario government would transfer public hospital surgeries, procedures and diagnostic tests to private clinics. CUPE began campaigning in earnest against this possibility in the spring of 2007 with a tour of the province by former British Health Secretary, Frank Dobson, who talked about the disastrous British experience with private surgical clinics. The door opened years ago with the introduction of fee-for-service hospital funding (sometimes called Quality Based Funding). Then in the fall of 2013 the government announced regulatory changes to facilitate this privatization. The government announced Request for Proposals for the summer of 2014 to expand the role of "Independent Health Facilities" (IHFs). With mass campaigns to stop the private clinic expansion by the Ontario Health Coalition the process slowed. But it seems the provincial Liberal government continues to push the idea. Following a recent second OCHU tour with Frank Dobson, a ministry spokesperson told the Hamilton Spectator: "The province hasn't yet "shifted low-risk procedures to out-of-hospital clinics". However, with the shift, the ministry hopes to provide patients with "quicker access to complex surgeries because hospitals will be able to get to more complex procedures sooner." Health Quality Ontario (HQO) is conducting a review of oversight programs to improve non-hospital clinics, the Ministry spokesperson noted. "The ministry will review HQO's recommendations to ensure sufficient quality oversight is in place prior to moving low-risk procedures into out-of-hospital clinics." The ministry's claim that it has not shifted procedures to out of hospital clinics is not exactly true -- we have only slowed down the transfer of work to IHFs, other sorts of private clinics have been taking hospital and other work for years. The IHF gambit is just the latest attempt to expand the role of privatized health clinics. And, as set out below, that history is replete with problems. The unpromising history: Hospitals are the main focus of the government’s health care cuts. They do not see community hospitals as providing a broad range of services to the local population, but instead wish to remove an untold range of services from local hospitals and transfer them to specialized private clinics. The proposal would remove the most lucrative, high volume and easiest procedures from community hospitals. The remaining community hospitals would be left with the most difficult services. If they chose to compete with the private clinics, they would have to specialize in a narrow range of services. The government’s plan is the opposite of one-stop, integrated public health care. This proposed privatization of surgeries and diagnostic tests is in addition to the aggressive attempts to remove non-acute care services from hospitals (e.g. outpatient clinics, complex continuing care, rehabilitation, long-term care, primary care, etc.). As acute care currently accounts for only about 1/3 of current hospital funding, these attacks are a grave threat to the viability of community hospitals, and in fact we are now seeing a wave of hospital shut-downs that is somewhat reminiscent of the Mike Harris era. Despite the government’s rhetoric about keeping care non-profit, services that are being cut from local hospitals now are being privatized to for-profit owned corporations. Even if the private clinics did start out as non-profit (which has not been the case so far) the whole system of private clinics could be privatized with a stroke of a pen. 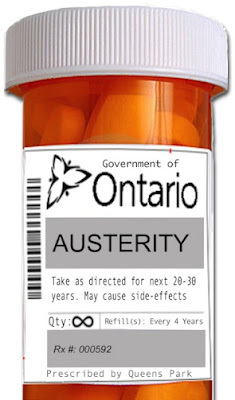 Ontario Health Care Privatization: The push for health care privatization in Ontario picked up in 2001 when Ontario Health Minister Tony Clement announced two privatized P3 hospital projects, the Royal Ottawa and the Brampton Civic (part of William Osler Health Centre). Spirited community-based campaigns, including P3 plebiscites in many towns, forced the Liberal government to greatly narrow the scope of the privatization of support jobs (i.e. CUPE jobs) in subsequent P3 hospitals. Nevertheless privatization of the hospital financing continues, despite revelations by the provincial Auditor General that confirmed claims by CUPE and others that the Osler project cost hundreds of millions more due to the P3. A subsequent report from the Auditor General on P3s indicated that billions of dollars have been wasted unnecessarily on these projects, mostly hospitals. MRI and CT Clinics: The PC government also tried to set up private MRI and CT clinics outside of hospitals. Community/labour campaigns however were able to stop this. A key factor was that, to increase their revenue, the private clinics were allowed to bill private patients for a certain number of hours each week (with the rest of the week dedicated to patients paid for by the public system). As the public insurance system must pay for all ‘medically necessary’ hospital services, the government was left to try to explain why any reputable clinic would allow patients to subject themselves to such tests for medically unnecessary reasons. Since this episode, private clinics have been in the news – but mostly for the wrong reasons. ORNGE and eHealth Privatization Scandals: Privatization scandals continued with ORNGE and eHealth. In the latter case, the Auditor General revealed rotten contracting out practices. By 2008, the eHealth Program Branch had almost 300 consultants compared to fewer than 30 full-time employees. “Relying too heavily on consultants can be costly,” the Auditor said. “Consultants are generally a lot more expensive than employees, and when they finish a project, they leave, often taking with them the expertise needed to maintain and operate the system they helped develop.” The eHealth contracting-out scandal helped force out the Health Minister David Caplan, along with the CEO of eHealth, and the board chair of eHealth. Private Surgical and Diagnostic Clinics: Shortly after CUPE warned the province of the dangers of private clinics through the tour of the province by the former British Health Secretary (i.e. Minister) Frank Dobson in the spring of 2007, tragedy struck. On September 20, 2007, Krista Stryland died after undergoing liposuction at a private clinic. Stryland bled excessively following the surgery. The College found that one of the doctors involved delayed calling 911, and when paramedics finally did arrive, they found Stryland lying in a pool of blood with no vital signs. The family doctor who performed the liposuction was ultimately publicly reprimanded and told that her “dangerous” behaviour was an “obvious betrayal of the public trust.” “Emboldened with time and experience, you proceeded to perform more and more invasive procedures and ultimately major surgeries without the benefit of formal surgical training. ...You put your own interests above your patients,” she was told. The government had let much of the emerging industry slip entirely free of public reporting and oversight. After the September 2007 death of Krista Stryland, the government was forced to require the industry to face some modest oversight several years later, in 2010. Unfortunately this was not by a public authority, but through self-regulation by the doctors (even though the doctors themselves had lobbied to expand this private industry). Eventually, in 2012, the College of Physicians and Surgeons released a report on "out of hospital premises" (one category of private clinics) that mentions that some 29% of the private clinics fall short in some way – but the College would not indicate which ones – or how they fell short. This caused public uproar, with the Toronto Star playing a leading role (as it would continue to do). Again, the government promised improvements. The Star followed up and revealed that the public reports from the College of Physicians and Surgeons fall far short. They also ran a series of often front page stories on serious quality problems at private clinics, including stories on life-threatening infections during outbreaks at four Toronto pain and colonoscopy clinics. Toronto Public Health investigated the outbreaks and the College of Physicians and Surgeons inspected the clinics, but their reports were kept secret. The new Health Minister, Eric Hoskins, ultimately responded by promising improvements of the clinics once again. He told the Toronto Star in the fall of 2014 that he has put the province’s public health units and colleges (including the college of Physicians and Surgeons) on notice that he wants investigation and inspection reports made public. “It is clear that our system must become more transparent,” Hoskins said, adding the new measures will allow Ontarians to find out if clinics have had problems with infection control and whether patients have suffered illnesses or died. Hoskins also reportedly asked for advice on this from Health Quality Ontario, an independent government agency that assesses and reports on quality in different parts of the health system. The College of Physicians and Surgeons responded by releasing in early 2015 a report which called for itself to take over a single system of oversight of Independent Health Facilities, the Out of Hospital Program, and other clinics as well. To date, the reports on the Out of Hospital Program on the College’s web site remain the same ― with threadbare comments. Time has run out ― the government should stop this failed experiment. More Private Clinic Problems: Over the summer of 2013, the government got into a messy dispute with private physiotherapy clinics. The government stopped 94 physiotherapy clinics from directly billing OHIP. Ontario Health Minister Deb Matthews said that, over the years, licences to provide these services have been bought up by large corporations. Moreover, she charged, the “existing 94 clinics have had an unlimited ability to bill the government and have become very creative in the way they bill.” The government claimed that an audit of 15,000 records from the clinics found that 58% of them failed to support OHIP billings. Five-minute exercise classes were sometimes billed as physiotherapy, care plans did not measure up, record keeping was incomplete, and physician referrals were sometimes lacking. “There is extraordinary growth in expenditures and the audit was one of those factors that just demonstrated to me that there were companies who were just taking advantage of the way the program was set out and taking advantage of their unlimited ability to bill,” then Health Minister Deb Matthews told the Star. By reforming how the money is distributed, the government claimed they will provide physiotherapy, exercising and fall-prevention classes to 218,000 more people, mostly seniors. And they are going to do this while providing less money for physiotherapy than they otherwise would: $16,000,000 less according to the Toronto Star. Still More Private Clinic Problems: The government was back at war with another group of private clinics in early 2014, this time the newly established private plasma clinics. The government, opposed to their plan to pay people for their plasma, wanted to shut them down. But the clinics refused. Indeed, they said they need no license from the government to operate. In the face of this open defiance, the then Health Minister Deb Matthews was reduced to calling in inspectors and threatening to get a court order. New legislation was also threatened. “I expect any company operating in Ontario, and especially in the health care sector, to operate within our laws,” Matthews told the Toronto Star. But she admitted it may take time to shut the clinics down. The private clinics remained unmoved: “Until that act is passed, the legal opinion we have is we don’t need a licence from the provincial government.” Perhaps they were then hoping that with an election coming a Progressive Conservative government would be more friendly. If so, that hope proved unfulfilled. Nevertheless, the Liberal government has not yet learned its lesson and announced that it will not encourage more private clinics. Operations can and do go wrong. In contrast with public hospitals, private specialty clinics are unable to handle many emergencies and simply call 911 for EMS. Will ambulances be able to move patients to hospitals when things go wrong? Indeed, private surgical clinics first came to public attention in Ontario when a young mother, Krista Stryland, died following a procedure. After some delay, the doctor called 911. Paramedics arrived at the clinic to find the patient in a pool of blood and with no vital signs. Is it appropriate to establish a system that inherently requires extra time to effectively treat patients who fall into emergency situations? Will the Ontario government establish a requirement that doctors be on site at all times? Will they require that specialty hospitals have emergency capacities (beyond calling 911)? Will they require the private clinics to disclose to patients the limitations of their emergency abilities? User fees: The Ontario Health Coalition has revealed widespread extra-billing by existing private clinics. There is little doubt that this will intensify with more private clinic delivery. But Ontario already has the highest share of private payment for health care in the country. Private expenditures in Ontario run to 32.3% of total health expenditures, higher than any other province (Saskatchewan is at only 24% private expenditures). In dollars, private payments for health care are 5.3% higher in Ontario than Canada as a whole, almost $100 more per person per year. Notably, increased private payment does not mean a reduction in public spending: governments in the U.S.A. spend far more money on health care than Canadian governments, both in absolute dollars per capita and as a percentage of the economy. This despite the fact that most Americans have no public insurance and private payment for health care in the U.S.A. far exceeds any other country. Billing problems are also evident in Quebec. In early 2013, the province decided not to renew the contract with Rockland MD, which has provided about 9,000 publicly funded surgeries since 2008 in Quebec. The public health insurer found that Rockland MD was charging people illegal facility fees. The former British Secretary of Health reports that such clinics in Britain were 11% more expensive than a hospital providing similar services. Doctors’ incomes: Doctors have lobbied for this new delivery form and it will create a new form of payment for doctors. But the introduction of alternate forms of payment for doctors under the Liberal government has gone hand-in-hand with huge payment increases to doctors, not savings. Since the Liberals were elected in 2003, new (or “alternate”) forms of payment to doctors have increased 430% through to 2011/12. With this increase, doctors have driven up their total clinical payments an astonishing 94%. Ontario spends more per capita on doctors than Canadians as a whole. In contrast Ontario spends less per capita on hospitals than Canadians.